Nail definitely aren’t the first thing you notice about a person; in fact, unless they’re extremely flashy or pointed out, most people don’t notice them at all. What most people don’t know is that the shape of your nails can actually say a lot about you and your style. 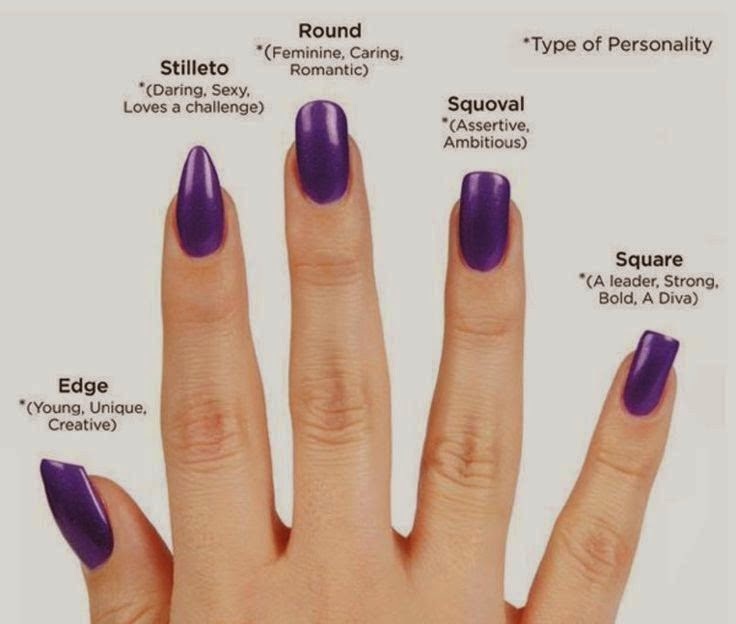 Below there will be six different types of nail shapes described. This shape isn’t as subtle as other shapes can be. People who sport this style aren’t afraid to try new thing, and they tend to go with experimental or statement styles as well. This nail shapes is similar to stiletto nails, but it’s rounded out at the tip instead of pointy. Those who sport this style are modern, care about quality, and avoid anything out dated or vintage. Round nail shapes are the most common and suit almost everybody. People who have this nail shape generally don’t like to try new thing with their nails, although they’re very trendy with their clothing. Their nails tend to take a back seat rather than being the star. People have this type of nails tend to be extremely low-maintenance and put very little effort into their style. This tends to be the jeans a t shirt type of person. This type of nail shape is a mix between square and oval. Those have this shape aren’t into experimenting, and have likely had nail shape for a long time. Their wardrobe tends to be classic, matching their nails perfectly. Enjoy and Share with friends ! !